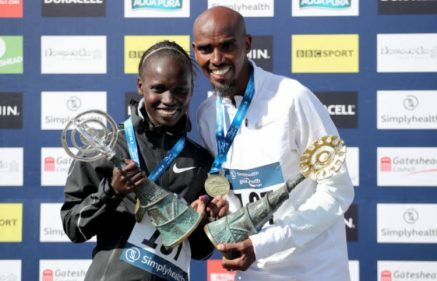 9th September 2018 – Two years ago Olympic and World Champions Sir Mo Farah (GBR) and Vivian Cheruiyot (KEN) won the Great North Run. They repeated the result with two dominant displays at this year’s event. Sir Mo stamped his authority on the race within the first mile as he burst to the front and set a high tempo. This was maintained throughout until Mo finally moved clear with two miles to run. This for once allowed him to be able to enjoy the cheers of the partisan home crowd along the seafront road and cross the line well clear in 59 minutes and 26 seconds. The women’s race was a much tighter affair with a Kenyan contingent of 4 athletes locked together deep into the race. It was Vivian who had the greater speed over the closing stages though, ultimately wining in 64 minutes and 43 seconds, 9 second clear of runner up Bridged Kosgei. There was also a welcome return to action for former World Champion Linet Masai (KEN). Having taken some time out of the sport for the birth of her daughter Linet showed she is well on her way back with a fourth place finish here and in a personal best time of 68 minutes 11 seconds.